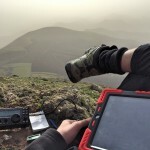 On the 14th of March me, Michael (G0POT) and Marty (taking his M6 soon) met-up for an activation of Walbury Hill (G/SE-001). The country was still very much in the grips of Winter with a cold Siberian weather system pushing down from the North, not perfect for a SOTA activation! We met-up for a spot of lunch first in a nearby gastro-pub and steeled ourself for some bracing conditions. We parked up at the National Trust car park on top of Walbury Hill and immediately felt the force and chill of the Siberian wind. This was certainly an activation to find a nice sheltered spot and soon enough we had walked past the trig point and decided to setup behind the round building/structure ahead. This was mercifully out of the worst of the wind. I chose to start my activation on 20m to show our unlicensed friend Marty the difference in propagation between 20m and 40m during the day. 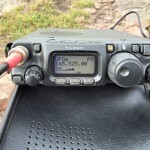 Michael (G0POT) decided to try 2m SSB using his Elecraft KX3 complete with the 2m transverter and a small hand held 3 ele Yagi. Within 7 minutes of spotting myself I had 9 stations in the log from Spain, Italy, Austria, Czech Republic, Portugal and Norway. The QSO’s were rapid fire not leaving much time to explain what everything meant to Marty. After this I took the time to explain what the acronyms meant and how the whole setup was working. 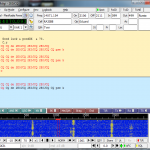 In the meantime Michael had no takers on 2m SSB despite spotting himself. We later found out a number of the regular chasers had listened but couldn’t hear him. This was perplexing as the VHF takeoff up here is pretty darn good! Next I connected the crocodile clips on the linked dipole for 40m. After spotting myself I had 15 contacts mostly from the usual G’s with Bill G4WSB being first in the log. Me and Michael explained to Marty how 40m NVIS propagation works and why contacts are generally so much closer to home. 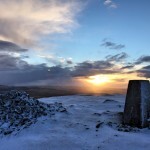 Despite the chill really taking it’s toll on all of us I decided (foolishly) to setup nearer the trig point (TP0302 – Inkpen) in order to activate it for the Worked All Britain Trig Point award. To setup quickly and get the pain over and done with Michael held the mast while I built up a run of 11 contacts before packing everything up in a hurry with numb hands. By this point we were all freezing and were jumping up and down to get the blood pumping a bit. After getting back to the car the pub was a very tempting idea, but not for a beer for once, instead for something hot to help us defrost. We had a debrief over some coffee and hot chocolate and came to the conclusion that we’d chosen a bad day for this activation. I want to go back to Walbury Hill on a nice day to experience the vast contrast, but the wind chill that cut through us that day will remain in my memory for some time!